Home Kool Kitty is bringing in the flowers for Earth Day!! Flower Cards!!! We love Earth Day and want to celebrate it ! 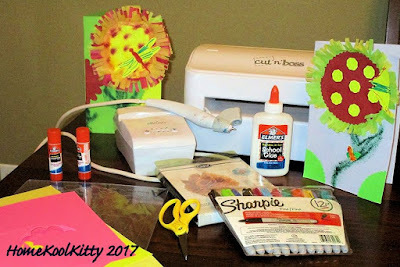 Using the flower die, cut out the flower (using construction paper) and the fringe (use the tissue paper). Fold one construction paper in half. Glue the flower as the base to the card. Add fringe to the flower base. In the video we show two different ways to do this. Using the sharpies, ebrush stems for the flowers. You can also decorate the flower and card. Last add butterflies, dragonflies...whichever you like to the flowers and cards. There you have it...the perfect card to welcome Earth Day, spring, whatever you desire.